Rafal Grzelak is poised for his first competitive Hearts start should injury rule Ashley Smith-Brown out of Saturday’s Betfred Cup tie against East Fife. The on-loan Manchester City defender is nursing a groin problem and Grzelak is preparing to step in if required. Smith-Brown was forced off after 28 minutes of Tuesday night’s Betfred Cup win over Elgin after aggravating his groin. Grzelak stepped off the substitutes’ bench to take his place and delivered a commanding performance, including the cross for Kyle Lafferty’s match-winning header. 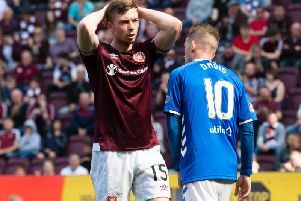 Medical staff at Riccarton were assessing Smith-Brown yesterday but, should Hearts decide not to risk the 20-year-old, versatile Polish player Grzelak will step into the left wing-back role for the East Fife match at Tynecastle. Head coach Ian Cathro is relaxed about the situation. He confirmed that Smith-Brown’s injury is not thought to be overly serious and said having a capable replacement is vital. “That’s one of the biggest things about us building a squad - making sure we have options in every position,” said Cathro. “Rafal stepped in on Tuesday night and we’re pleased with him so far.